I wrote this essay last year and it doesn’t have a home so thought I’d post it here. I want to thank all the people that helped me out with this one. In 2008, Te Papa Tongarewa presented the exhibition “Rita Angus: Life and Vision” as part of its 10th year anniversary celebrations. This extensive retrospective of Angus’s work was closely associated with Jill Trevelyan’s comprehensive biography “Rita Angus, an Artists’ Life”. The exhibition was co-curated by this author and curator of New Zealand Historical Art at Te Papa, William McAloon. After a season at Te Papa “Life and Vision” went on to be toured to the Dunedin, Christchurch and Auckland public art galleries. The focus of this essay is to explore the issues around the conversion of the original exhibition to a touring show and how a refined selection of works and re-hanging of the show in diverse gallery spaces affected its original integrity. The original exhibit at Te Papa displayed 200 of Angus’s works as well as sketch/ note books and ephemera. This was an opportunity for the museum to conserve, restore and show many works from the Angus collection on loan from the Rita Angus Estate that had been sitting in storage at the National Gallery (now Te Papa) since her death. Much of the content was drawn from this collection with key pieces from private collections and other institutions. Rather than grouping works by media or subject, the Life and Vision exhibition collected works together chronologically in domestically scaled ‘rooms’ focussing on important moments or beliefs in Angus’s life. The catalogue asserts the reasoning for this as a desire expressed by Angus in communication with John Money “’a kind of temple of art’… at the heart of which would be the three goddess paintings ‘and around the perimeter a series of equivalent of small chapels, in each of which would be a set of smaller paintings or watercolours that are somehow related to one another’” (McAloon & Trevelyan, 2008, p. 15). Neil Pardington’s exhibition design for the Tower Gallery did justice to this idea. Unlike the previous 1982 retrospective at the then National Gallery, this exhibition showed many unfinished works. While this gave us glimpses into process and technique but I wondered how Angus herself would have made of it , as she was very protective of her works and was uncomfortable publicly showing anything in progress. (Trevelyan, 2008). One aspect of the exhibition was the huge amount of written material to absorb in signage and labelling, requiring several visits for full appreciation (Hurrell, 2009). Yet there has been critique of the show and of Trevelyan’s book that little has been made of Angus’s artistic influences (Barr & Barr, 2008; Hurrell, 2009; Watson, 2008). Finally my notes from my visits to Life and Visio’ at Te Papa describe a discomfort at the ‘rat in a maze’ effect of the exhibition design. On reflection I think this may have been contributed to by the crowds in attendance. At some point it was decided to extend the ‘gift to the nation’ (Amery, 2008) of ‘Rita Angus: Life and Vision’ exhibition to a touring show going to Dunedin, Christchurch and Auckland at no cost. I believe this was the first time Te Papa in its role as National Art Gallery has toured an exhibition. In February 2009 I visited the Life and Vision at the Dunedin Public Art Gallery and it immediately became apparent to me that I was seeing a very different show. James Ayres in ‘Touring Exhibitions’ (1995, p. ix) states “Whatever its content, the touring show must be constructed metaphorically and literally, for tour… there is no such thing as converting a one-off temporary exhibition into a touring show”. However on discussion with several New Zealand curators, deciding to tour often seems to be an after-thought in the exhibition process here. Ayres does go on to suggest that an exhibition may establish a travel itinerary of its own volition due to the loans from other institutions, and in the case of Angus I believe this also occurred because the artist is of national import with connections to the landscape throughout New Zealand. In the same book Julian Spalding states that “National museums have a responsibility to serve their nation” (1995, p. xiv) which backs Ayres assertion that touring is the best way for objects to reach the widest possible audience, regionally and nationally. The content of the touring exhibition was reduced from 200 items to 130. Many later era and incomplete works were excluded, as well as others, whose private owners declined to allow them to tour. A key work that was not available was The Sun Goddess (Angus, 1949). This undermined the concept of the heart of the exhibition being all three goddess paintings in the ‘Pacifism and the goddesses 1944-53’ grouping. Michael Harrison raises this point as a critical test of a touring show, asking how seriously would an exhibition be impacted by non-availability of certain exhibits (1995). Although interesting relationships were still made between the two remaining goddesses (mirroring each other across a corridor space in Dunedin), I question the temple of art arrangement which seemed firmly adhered to in the Christchurch and Auckland hangs, when a key painting was absent. Although Angus’s vision of a retrospective exhibition was centred around the three goddess paintings, there is some indication that a fourth goddess painting was intended (Brownson, 1982) and so perhaps having all three present, while desirable, is not crucial. A major issue in any touring show is diverse spaces that the exhibition may be displayed in. A discussion of domestic-like (feminine) interiors versus factory-like (masculine) spaces can be found in Greenberg (1996); gallery architecture must be taken into account as there is a danger of the work being reduced to nothing (Buren, 1996). Although Angus was a feminist, her art remained small and intimate and certainly suits the domestic spaces of the rooms in the initial exhibition. While Te Papa provided exhibition specifications (which may have been fine tuned as the tour progressed) apart from fixed groupings, latitude was available to the host galleries as to some aspects of display. In Dunedin ‘Life and Vision’ was displayed in several connecting spaces, the McMillan gallery, Wenita corridor, and Trust galleries 1, 2 and 3. The main gallery was open and with a high (industrial looking) ceiling and no ‘rooms’ were re-created, although groupings were retained. Labelling, which I assume came with the exhibit, did not reflect this arrangement and one actually read “in this room…”. This gallery was linked to the three smaller spaces by the Wenita corridor area. I found this quite disconnecting and was not inclined to linger. Buren describes this phenomenon as holes in the architecture, ‘disturbed spaces…corridors disturbed by those who walk along them’ (1996, p. 318). In this hang, the temple of art concept was mostly lost and the groupings had much less impact when not defined physically by rooms. The intimate nature of much of Angus’s work was lost in the main gallery, the high ceilings and seemingly endless white walls dwarfing the paintings. The Christchurch show was completely different. Christchurch Art Gallery is described as having “a set of galleries that are easily the best exhibition spaces in the country” (Barr & Barr, 2009). Exhibition designers choose to use a deep red wall colouring and re-used divisions from a previous exhibit to re-create the temple of art. Some quite dramatic viewpoints occurred. The sightlines led visitors to A Goddess of Mercy (1945-47) in an unexpected way and that picture was opposite (although distant from) the 1967 Self-portrait (1967-68). This seemed to be a very successful re-telling on the ‘Rita Angus: Life and Vision’ story. In Auckland, Life and Vision was exhibited in the New Gallery due to reconstruction of the main galleries. The New Gallery is a modernist space and quite small; negotiations were had as to whether some works could be dropped just to fit the exhibition into the available area. In contrast to other venues, the lighting was very different and much brighter, akin to natural light from above. Although again the ‘rooms’ were recreated, it was a much more intimate space albeit with white walls and concrete floor. Angus’s work didn’t sit as well in this more industrial and masculine space, as they did in Christchurch but the smaller spaces force you closer to the works (Hurrell, 2009). The changing gallery spaces certainly impact on the exhibition and also the viewer. Ward discusses how physical arrangements and presentation of exhibitions seeks to “turn viewers into good viewers” (1996, p. 460) but also to be careful not to assume a “normative viewer” (p. 461) who will react to the exhibition design in a uniform way. Carrier describes this as “the poetics of the Art Museum” (2009, p. 221).Viewers I have talked to who had not seen the original exhibition in Wellington at Te Papa, were unaware of the significance of the three goddesses and so did not notice a lack. These people were also able to accept the show ‘as is” rather than comparatively as I have done here. Rita Angus: Life and Vision is an eminently successful exhibition and was described by one reviewer (after seeing the Christchurch version) “It’s textbook curatorial practice, which should form a model for such things for New Zealand museum studies and curatorial courses.”(Bernstein, 2009). Also the touring aspect, at no cost to the host institutions, is certainly the national museum serving the country and sets an excellent precedent. Sometimes practical problems of exhibiting have to be born. Although it was very unfortunate that the Sun Goddess painting could not tour to complete the heart of the temple of art, the exhibition worked well in most of the host galleries, despite her absence. While issues around work selection and availability, display spaces and design at each venue were a distraction for me, I do not believe they detracted substantially from the curatorial intent and integrity of the original exhibition. Amery, M. (2008). Painter’s Delight: Rita Angus Life and Vision [Electronic Version]. The Big Idea. Retrieved 14 August 2009 from http://www.thebigidea.co.nz/node/30916. Angus, R. (Artist). (1945-47). A Goddess of Mercy [oil on canvas, 866 x 615]. Angus, R. (Artist). (1949). The Sun Goddess [watercolour, 532 x 420 mm]. Ayres, J. (1995). Introduction. In M. Sixsmith (Ed. ), Touring Exhibitions: The Touring Exhibitions Group’s Manual of Good Practice (pp. ix-xi). Oxford: Butterworth-Heinemann Ltd.
Brownson, R. (1982). Rita Angus. In L. Bieringa (Ed. ), Rita Angus. Wellington: National Art Gallery. Buren, D. (1996). Function of Architecture. In R. Greenberg, B. Ferguson & S. Nairne (Eds. ), Thinking about Exhibitions (pp. 313-319). London: Routledge. Carrier, D. (2009). The Poetics of the Art Museum. Curator: The Museum Journal, 52(3), 221-228. Greenberg, R. (1996). The Exhibition Redistributed. In R. Greenberg, B. W. Ferguson & S. Nairne (Eds. ), Thinking about Exhibitions (pp. 349-367). London: Routledge. Harrison, M. (1995). Concept. In M. Sixsmith (Ed. ), Touring Exhibitions: The Touring Exhibtions Group’s Manual of Good Practice (pp. 14-16). Oxford: Butterworth-Heinemann Ltd.
McAloon, W., & Trevelyan, J. (Eds.). (2008). Rita Angus: Life & Vision. Wellington: Te Papa Press. Spalding, J. (1995). The touring exhibitions manifesto. In M. Sixsmith (Ed. ), Touring Exhibitions: The Touring Exhibitions Group’s Manual of Good Practice (pp. xiii-xv). Oxford: Butterworth-Heinemann Ltd.
Trevelyan, J. (2008). Rita Angus, An Artist’s Life. Wellington: Te Papa Press. Ward, M. (1996). What’s important about the history of modern art exhibitions? In R. Greenberg, B. Ferguson & S. Nairne (Eds. ), Thinking about Exhibitions (pp. 451-464). London: Routledge. Watson, R. (2008). Rita Angus: A Life and a Vision. Art New Zealand, 128, 48-53. After reading CherylBernstein’s wonderful review of Rita Angus in Christchurch, and some ensuing discussion I realised how art ignorant I really am. The thing is I still don’t really understand “curation” even with this great description courtesy of Alibi. I had not considered for example the role of the designer in how a show looks. The thing is I now have even more questions regarding the Rita Angus exhibition and also the subset of works “on tour”. So here are some of my questions and the reasons why I want to know. Just what is the designers role in staging such an exhibition? How were works initially selected ie by what criteria? At Te Papa there seemed too many, in the touring show it seemed to me important works were missing. And then I saw some wonderful Angus works at the Eastern Southland Art Gallery that weren’t included (or apparently considered). 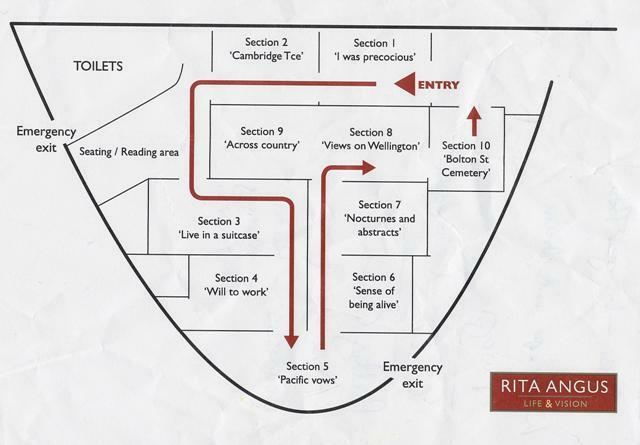 So this explains the maze effect at the initial show (which is, as I understand it, replicated in Christchurch). BUT if the three goddesses are so central, why are only two “on tour”? I want to say that I loved the Life & Vision exhibition as I loved Trevelyan’s book. The exhibition was a bit like the movie version :-). A particular thing I appreciated was the inclusion of sketches and unfinished works so you could get a feel for the process and lots of context (bordering on too much in a gallery situation?). As a historical show yes definitely comprehensive and diligently researched and maybe my earlier gripes are design issues rather than curation? The most beautiful book has come into my hands. Rita: Seven Poems by Colin McCahon. I found the content intriguing but the book itself and the production leaves me in awe. I like knowing all this about a book. And this book has a weight about it – although somewhat spoiled by the plastic covering and the University stickers that have been attached. It is simply beautifully crafted, a work of art in itself. I noticed that some of the Rita Angus paintings in the John Money Collection at the Eastern Southland Gallery were worthy of inclusion in the “Life and Vision“. Arguably (and this is only my opinion) the two moon paintings in the Money collection are equal or better than those in the show. One is from the strangely ovular 1965 series but I prefer “Moon, London, 1960” (couldn’t find a pic sorry). Because I am naïve about these things I have questions. Mainly how were the pictures selected for “Life and Vision”? It appears they mainly came from the Angus Estate/Te Papa. The focal point of my Big Day Out yesterday was my first visit to the “new” Dunedin Public Art Gallery. I was not expecting too much to be honest as the exhibition list wasn’t spectacular and I’d seen 3(ish) of the shows before – Rita Angus at Te Papa, Joyce Campbell at the New Dowse and Hodgkins* (albeit not the same ones) at Mahara. However it presented an opportunity to see how different they might look in different locations. The Rita Angus exhibition was a focus and has been promoted extensively here and as William McAloon pointed out they’ve been running a “nice” events programme in association with it. The works on show are a subset of the Te Papa exhibition and I thought that made it much sharper in general. I also preferred the layout in constrast to Te Papa, although maybe it was a little too loose and as it wasn’t divided into the same ‘rooms’ the labels didn’t make sense in some cases. Major disappointment for me was that the Sun Goddess was AWOL and the other two goddesses were in the same room but facing each other. As I was saying (and probably being all pretentious) to the friend I was with, I’d wanted to revisist the maiden, mother, crone aspects for the three – yay for the internet! Interestingly on the same floor as Rita was the Peter Stichbury exhibition -weird and disturbing. I don’t really know what to make of it but it was certainly a contrast the the Angus portraits (although some similarity in the eyes). David Eggleton has written a review in a recent Listener thats worth checking out. Initially I thought Joyce Campbell’s Ice Falls were really badly displayed but various vantage points around the gallery gave a better view – one being across the atrium through a triangluar window at the end of the Angus exhibition. Still I think the way they were hung on columns at the New Dowse worked better. They are awesome photos and I don’t think you got the towering, overbearing nature quite the same way. Over all I liked the place and thought some aspects cleverly handled eg Victorian colours on the walls of the ‘works from the collection’ rooms. I feel there are going to be great things to see here and with the new Director it will be interesting to see what transpires. I also had a really great lunch at Nova next to the gallery including celebratory bubbles. * I don’t mean to be dismissive of Hodgkins but to me many of her works can be generic in a way they they kind of all run together.